When you’re feeling unhappy, you might also begin to feel helpless to change your situation. Read on to learn how one woman tries to tackle those problems. Can you think of moments when you could use a good strategy to combat unhappiness? [Thoughts★★] Can You Design Happiness? (P1) Could there be a design solution to unhappiness? 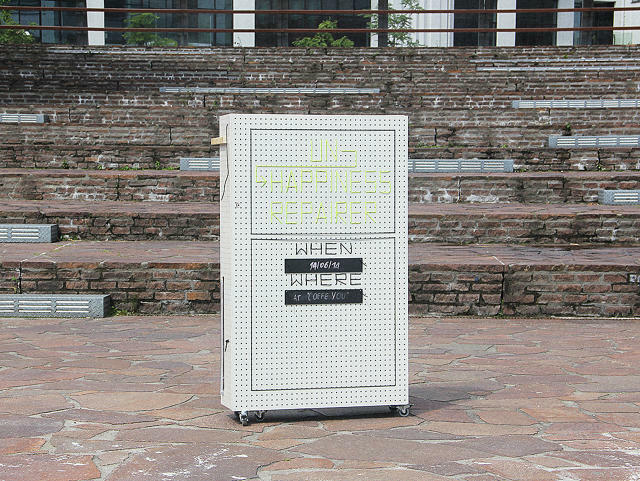 Silvia Neretti, an Italian designer who just graduated from the Design Academy Eindhoven, explores the relationship between psychology and design in her master’s thesis, the Unhappiness Repairer. This pop-up therapy stand, not unlike Lucy’s psychiatrist’s booth in Peanuts, injects “happiness into everyday life,” according to Neretti. (P3) Unhappiness, she argues, is the result of a specific context (though as far as empirical psychology goes, she doesn’t provide any studies to back up that assertion). She becomes unhappy when her father bogarts the couch, splaying across it and not engaging her in conversation. As a design intervention, she creates cardboard subdivisions for the sofa–much like these park benches designed to prevent homeless people from sleeping on them–and suddenly, the video shows her and her father chatting happily. (P4) In another case, she helps a woman, lonely and recently separated from her husband, think about her unhappiness spatially. Neretti maps the woman’s home, and using basic cardboard boxes, she covers the house in whimsical new creations–cardboard shelves, a cardboard desk to work at, cardboard decorations to replace tired paintings–all designed to get the f to think about her home in a new way, and eventually, move on. (P5) Designers can never replace therapists and mental health professionals, and it’s likely that getting your distant father to talk to you isn’t quite as easy as making his favorite relaxation spot really uncomfortable. But having a third party help us rethink the roots of our unhappiness? Never a bad thing. Describe Silvia’s thesis project. What artifact did she make and what message is she trying to get across with the project (P1)? Do you think design can help making a happier life? If so what would you design for yourself? If not, why you don’t believe so?